﻿Discounted self-catering cottages and Special Offers large holiday houses. Cheaper self-catering accommodation. All discounted holiday houses will appear in the search using the form above. Property owners want to have full occupancy - so prices often get reduced offering cheaper deals at the last minute - or if there is a cancellation to a booking - this may be for a weekend, a week or two weekly booking. 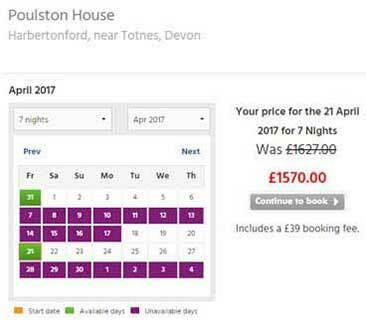 If it's a last minute booking - don't forget to check details such as - is the property pet friendly? 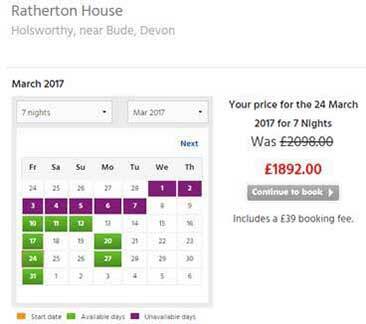 There are many reason why Special Offers get applied, take advantage of the discounts offered and get a cheaper holiday deal. Special offers - Hand picked. Special offer rental price: Now discounted to £1829 = £22 per person per night. Restriction: Available for couples and families only. Pets are not allowed. w/c 31 March + 21 April - sleeps 12 people - fantastic value means you pay less than £19 per person per night. There is an electric car charging plug-in point near to this property. Pets are not welcome at this holiday house. Large rental cottage in Herefordshire near Ross-On-Wye with 6 bedroom, sleeps 14, Pets friendly, Barbecue, Wifi, Cot Available, All En-suite. Big party house in Dumfries and Galloway near Stranraer with 6 bedroom, sleeps 12, Pets friendly, Golf nearby, Pub within 1 mile, Wifi, Coastal Property, Private Hot Tub. Large holiday house in Staffordshire near Stafford with 5 bedroom, sleeps 14, No pets, Barbecue, Ground Floor Facilities, Golf nearby, Pub within 1 mile, Wifi, Cot Available, Fishing Nearby.